Merkur safety razors are manufactured by DOVO Solingen, a German-based company that has been producing some of the finest cutlery and shaving items since 1906. The techniques used by the skilled artisans at DOVO Solingen have been passed down from generation to generation as part of a time-honored tradition that prizes quality above all else. Merkur safety razors, like the well-loved Merkur 34C, are, indeed, some of the most popular and well-loved safety razors available today. Unfortunately, with all of the Merkur razors available on the market today, choosing between them can be a bit confusing. That’s why, in this article, we are going to discuss the most common Merkur razors, explain some of the differences between them, and give recommendations based on each one’s qualities and features. 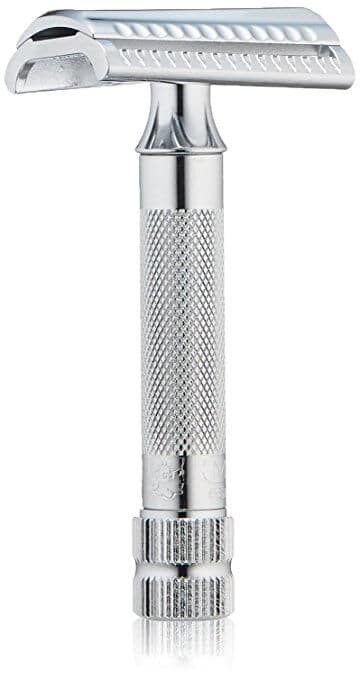 The Merkur Classic 2-Piece Double Edge Safety Razor is well-known throughout the world of shaving. Men for generations have grown up using this classic, timeless razor because it’s tough on hair but gentle on skin. Today, there are four variations of the Merkur classic including the Merkur 34C, 34G, 38C, and 43S, and we’re going to discuss all of them today. 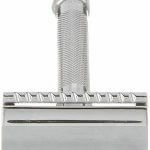 This Merkur razor is a 2-piece device meaning that the top piece comes off with a simple twist of the bottom knob for you to swap out the safety razor blades. While not as convenient as the butterfly closing mechanism, the 2-piece Merkur safety razors is still easy enough to handle when your hands are wet especially with the knurled grip. They’re also easy to clean. You can wash out all of the hair under the blade simply by lifting off the top piece and running the handle under the faucet. 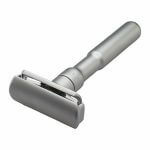 The 34C, which is easily the best selling Merkur safety razor, is a heavy device with a short thick handle meant to shift the weight to the head. With the extra weight, the razor will do the work for you. There’s no need to put any extra pressure on the razor when shaving even if you’re slicing through very thick hair. That being said, this Merkur razor isn’t overly aggressive either. It’s got a closed comb making it perfect for beginners. You could theoretically pair it with a very aggressive blade like a Feather if you wanted as close a shave as possible, but you should stick to smoother blades if you have sensitive skin. The 34G is an identical copy of the 34C but with gold plating as opposed to the silver chrome on the original. The 38C and 43C, by contrast are slightly heavier at 111g and 149g respectively as opposed to the 77g Merkur 34C. The handles on these Merkur razors are also significantly longer. The handle on the 34C is 3.04” while the handle on the 38C is 3.79” and the handle on the 43S is 3.82”. The difference, admittedly, is not enormous, but the extra length might make shaving that much more comfortable for men with larger hands. The 43S in particular comes with a round, brushed stainless steel handle that’s significantly larger in diameter than the original editions. The Merkur Classic 3-Piece Double Edge Razors are smaller razors designed either for men with light facial hair growth or men with thick beards but sensitive skin. Like with the 2-piece collection, there are four razors that make up this Merkur razor set: the 23C, 33C, 25C, and 15C. Essentially, the 23C and 33C are closed comb razors with long and short handles respectively, and the 25C and 15C are open comb razors with long and short handles respectively. The 25C and 15C Merkur razors have open comb designs that expose more of the blade. At less than 60g a piece, these razors aren’t heavy enough to be considered overly aggressive. However, the open comb will align thicker beard hairs and prepare them to be cut. In this sense, these razors can handle thicker facial hair without irritating sensitive skin. That being said, the blade on the 25C specifically is set very close to the comb. So, even with the open-comb design, the 25C Merkur safety razor won’t give a significantly closer shave than the 33C though it can hack through thick hair without getting caught. 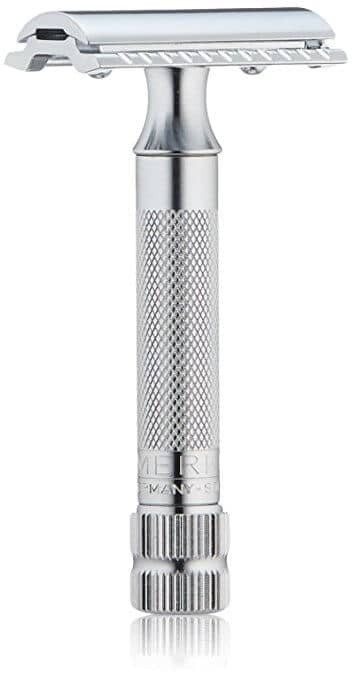 The Merkur Futur Adjustable Double Edge Safety Razor is, in a word, the last Merkur razor you’ll ever need. Available with a polished chrome, gold-plated, or stainless steel matte finish, the Merkur Futur is not only elegant but incredibly convenient. 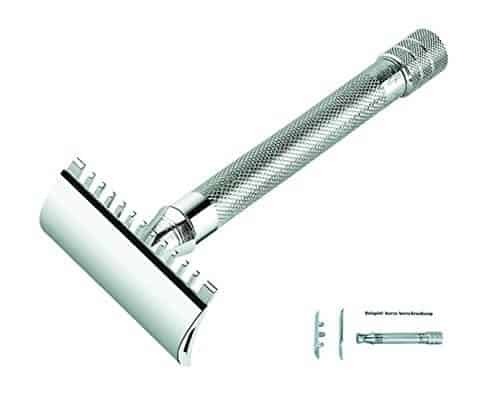 Unlike standard, fixed Merkur safety razors, this Merkur safety razor can be adjusted. Besides weight and blade sharpness, the blade gap largely determines how aggressive a safety razor is. With a simple turn of the knob, you can easily adjust the blade gap on the Merkur Futur using a scale measuring 1-6. If you’re shaving your cheeks, you can set the razor to its most aggressive settings at 5 or 6 to get a very close shave. Then, you can turn it down to 1 or 2 when you’re ready to shave sensitive areas like the neck and upper lip. That being said, this razor is extremely aggressive, so if you have sensitive skin, 2 might be the highest you can go. Even if you have normal to tough skin, you should be very careful to shave in front of a mirror because it’s quite easy to nick yourself with this Merkur razor. You’ll also want to dry off your hand periodically because the Merkur safety razors handle can get a bit slippery and dangerous when wet. Because this Merkur safety razor is somewhat bulky and difficult to maneuver, it’s probably not ideal for beginners. Plus, it’s fairly aggressive for anyone who’s just learning how to use safety razors, but once you’ve used two or three, the Merkur Futur is the razor you’ll want. With its adjustable blade, it can handle pretty much any job you can throw at it. Even though it’s 1.5 times the price of the Merkur 34C, it’s of significantly better quality and is worth every single penny. The Merkur Slant Bar Double Edge Safety Razor is a closed-comb heavy razor with a slant-bar head designed to more easily slice through thick hair. Though the slant-bar design seems like it should be incredibly aggressive, this Merkur razor is actually more mild than you might otherwise assume. Of course, at 79g or 113g, the weight itself will help do most of the work, but the slant-bar is more efficient than it is aggressive. Because it can attack the hair from a slightly different angle, this Merkur razor slices through thick hair even without an open-comb. 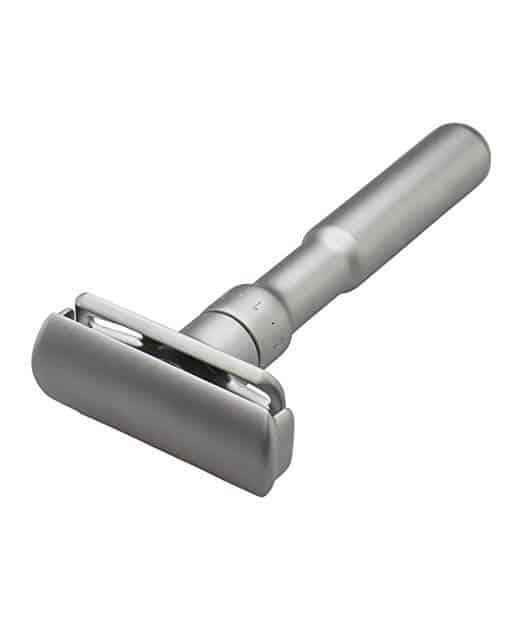 Even though the head is slanted, any standard double edge blade will fit inside this Merkur safety razor. However, it is a bit tricky to reload blades. This Merkur razor is available as either a two- or three-piece design, and when you open up the head, you have to be careful to align the blade correctly before screwing everything back together again. 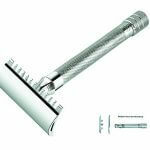 The Merkur Futur 23C is one of the most gentle Merkur safety razors available. It has a relatively small blade gap and a closed comb. It’s perfect for men with sensitive skin or men who simply don’t have the time to shave with a more aggressive razor. Alternatively, you could also purchase this razor without a guard. The guard is what prevents you from cutting too deep into your face, and while it is a helpful safety feature, you could get a much closer shave without it. 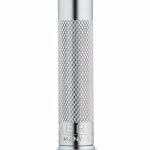 This Merkur razor also has an extra long handle, which is perfect for men with large hands as well as those who are transitioning from disposable razors and cartridge razors. 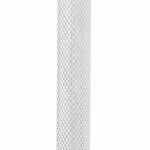 Disposable razors are designed with extra long handles while safety razors usually have shorter ones. You’ll naturally want to hold your hand closer to the blade when using a safety razor simply because the blades are so sharp. The shorter handle will give you the extra control and maneuverability you’ll want with safety razors. However, some still find the small handles a bit awkward and difficult to grasp. Still don’t quite understand? Not sure which Merkur safety razors is for you? Leave a comment below to tell us your thoughts!